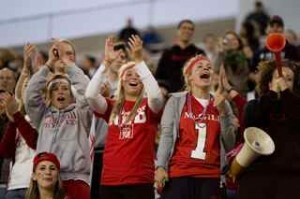 The largest home football crowd in 45 years turned out to cheer on the McGill Redmen Friday, Sept. 19. Unfortunately, most of the 6,218 on hand went home disappointed after the visiting Bishop’s Gaiters dumped the home side 45-21 in the inaugural Fill the Stadium night, an event that raised funds for a number of student organizations through ticket sales. With a tailgate party, youth players and cheerleaders decked out in their uniforms, and perfect football weather, the stage was set for a potential pigskin classic. But things got off on the wrong foot for McGill when rookie kicking sensation Austin Anderson injured his hip in the pre-game warm-up. It was all downhill from there for the Redmen, who trailed 35-7 at the half. Bishop’s Senior RB Jamall Lee ran roughshod over the home team, racking up a Quebec University Football League record 391 rushing yards and scoring four touchdowns in the process. McGill QB Matt Connell passed for 334 yards and three touchdowns. His 39 completions set a QUFL single game record. The contest was a key one for the Redmen and Gaiters, who both started their seasons with 0-2 records. The Redmen head over the mountain for their next game, a Saturday Sept. 27 clash with the UdeM Carabins. Kickoff is set for 13:00. Notes from the course, diamond: McGill golfer Victoria Kayser became the first ever McGill woman to take individual honours at an intercollegiate golf tournament. The 19-year-old management sophomore and native of Germany captured the Omnium Rouge et Or at Quebec City’s Golf de la Faune. Tied with a pair of UdeM Carabins golfers after the 36-hole tournament, Keyser’s par on the first playoff hole gave her the victory. The McGill team finished fifth behind Laval, Montreal, UQTR and UQAM. McGill’s baseball Redbirds are off to an excellent start. The team boosted their record to 6-2 by taking both ends of a Sunday doubleheader (7-2 and 8-2) against the University of Ottawa. The ‘birds play four games in two days this coming weekend, with a doubleheader at Collège Lafleche Saturday Sept. 27 and another twin bill at Carleton Sunday. League playoffs begin Oct. 3. Game of the week: With most McGill teams on the road this coming weekend, the soccer Martlets and Redmen inherit centre stage as they play host to visiting Laval at Molson Stadium Friday Sept. 26 (at 6 p.m. and 8 p.m. respectively).